Heat the oil in a medium-sized pot, add the bacon and fry until golden. Add the garlic and onion and cook until the onion is translucent. 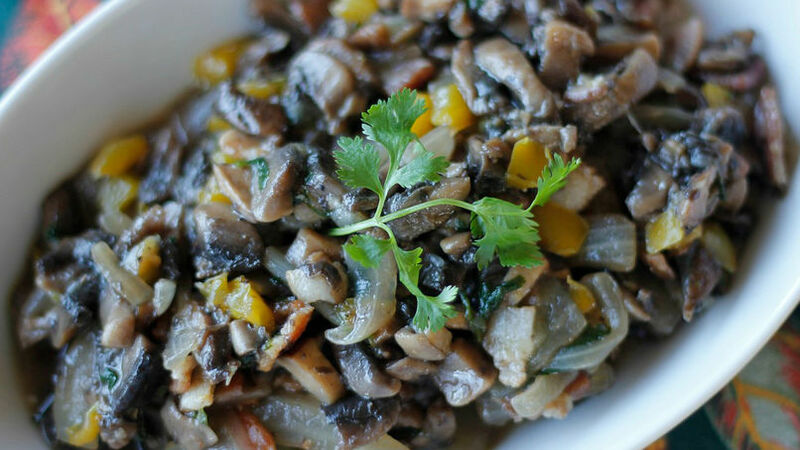 Add the yellow bell pepper, white and mushrooms, water, salt and pepper and thoroughly combine all ingredients. Let the stew boil for 15 minutes, uncovered, until the water has reduced and the mushrooms and bell pepper are bland. Mushrooms taste better when fresh. I recommend purchasing them the day of, or a few days before preparing this stew. Mushrooms are very delicate. Gently wipe and rinse with some water to remove any dirt, but avoid submerging them since the water will change the mushroom’s consistency. If you’re looking for an inexpensive recipe to satisfy your family, you’ve come to the right place. I remember when I was little my mom would prepare vegetable meals two or three times a week since we couldn’t buy meat every day. Mushrooms were, and always will be one of my favorite vegetables. I watched with curiosity the way she combined them to create different flavors. Nowadays, this delicate vegetable, the mushroom, regularly appears on my menu. This recipe is full of sabor and is very easy to prepare, plus its versatility will allow you to use it in different ways. Heat some corn tortillas and use the stewed mushrooms as a filling. Buy rolls and make tortas (sandwiches). Grab an avocado and fill the center with these deliciosos mushrooms. Anyway, the options are countless.